Hot summer Saturdays are made for running through fields. As long as you don't have any real work to do, of course, other than chasing toddlers through sunflowers. This past weekend we took friends of ours out to the Bowden Sunmaze. Good city folks who don't have much in the way of a yard and whose outdoor experiences focus on hiking and fishing they oohed and ahed at the countryside North of Calgary. They showed their kids how corns grows (after some considerable debate by us parents on the purpose of the grassy/flowery part on the top of the stalk), we tested raw sunflower seeds, ran through the fields, pet the donkeys, and had a picnic. And all this a mere hour away from the city. The Bowden Sunmaze is owned by Eagle Creek Farms. Part of the Innisfail Growers they produce a variety of vegetables to sell at various Alberta Farmers Markets. 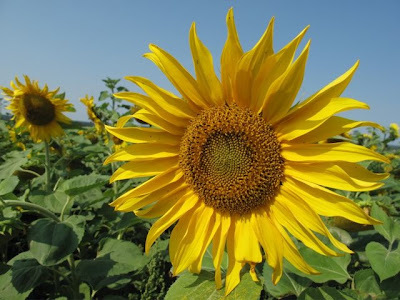 You can also come to the Sunmaze and U-Pick vegetables and flowers. They have potatoes, onions, beans, chard, kohlrabi, turnips, carrots, lillies, zinnias, grasses, and so much more. And don't forget the garlic, Farmer John's speciality. 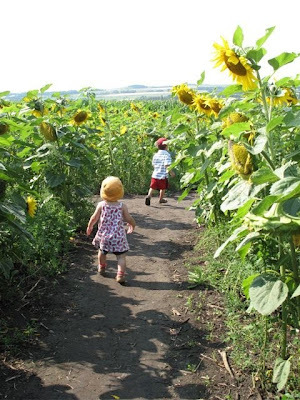 Of course, U-Pick is great, if you have the energy after tearing around after 4 little ones through both the sunflower and two corn mazes. Sadly, we did not. But we did get some fresh garlic in the store and visiting John at the Calgary Farmers' Market the next day. 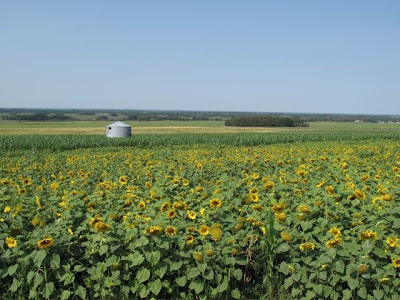 But The Monster has been asking about the donkeys and the sunflowers so a return trip might be necessary in the coming week. The Sunmaze is a perfect example of agro-tourism. If you build it they will come. Families and tourists come for the maze, and leave with arms laden with veggies and flowers. This includes the carloads of Chinese tourists there the day we went and the numerous families chasing each other through the maze. And hopefully those people will start visiting the market if they don't already just because they remembered that the Eagle Creek folks would be there. The set-up is wonderful. Beyond the flush toilets for the city folks, there is a defined picnic area complete with tables, and all surrounded by a menagerie of animals to entertain the little ones. There is nothing gimmicky - unless you count the mazes themselves - to bring people in. There are no bouncy castles, animal races, or balloons - all irrelevant on the farm but popular for bringing in families. 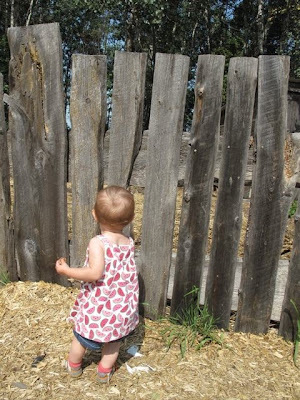 All our kids were terribly excited to watch the lambs and calves, try to pet the donkeys, and risk a peck in order to have the chickens take a piece of grass from their hands. Sure, it isn't the down and dirty of real farm work, but I think these are all valuable experiences for them. Like I said, next time we'll take them in the fields. And The Monster already understands that that calf will grow up to be her steak. She still says moo when calling it, but in the next breath she'll ask which cow we're having for dinner. 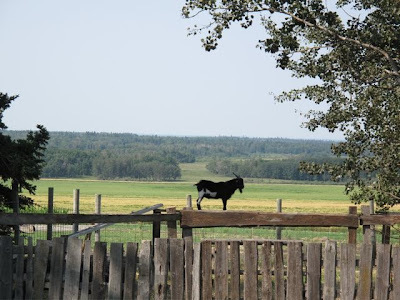 As our afternoon wound down and the kids started demanding their naps we took one last wander through the property, with me itemizing the U-Pick opportunities that would be easy for kids (onions and beans), we all commented on the luxury of the experience. Even our box-store grocery shopping friends took the time to explain some food production to their kids (and each other). We remarked at how easy it is to have an experience like this so close to the city. And we left with some fresh garlic. 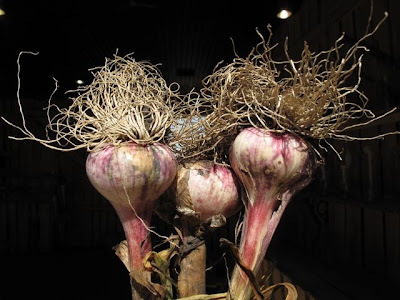 Some very strong, make any Ukrainian or Italian proud garlic. It isn't too hot. There is no family crisis. And we aren't being pulled in ten million directions. Nope. It's just a week filled with dogs using beds and carpets as bathrooms, teething babies, whining and sniveling Monsters, taking care of the neighbours' incredible barfing cat, and a miserable time at work. So no, I don't feel like cooking. Last night we went out. Yeah, that was a mistake. The girls are normally great in a restaurant, but last night they were not. So rather than resort to true laziness and simply boiling water for pasta I pulled out some leftover bread from Aviv. A quick survey of the counter and fridge revealed the rest of the ingredients for dinner: tomatoes, peaches, and some mallow and green onions from last week's CSA delivery. Yup, when you are too lazy to cook you can still have a damn tasty meal. 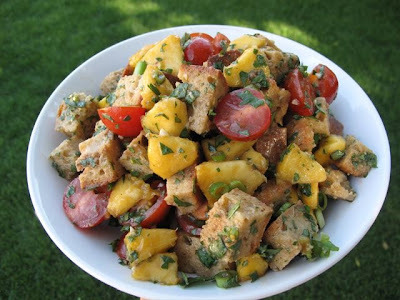 Just 10 minutes of chopping and a quick drizzle of oil and vinegar and you've got panzanella. For us non-italians, that means bread salad. This is a technique more so than a recipe. I've never made this without tomatoes, but the rest of it depends on what herbs and other veggies I have around. Sometimes cucumber and red onions. Sometimes coriander and roast peppers. And today, peaches, mallow, and green onions. 1. 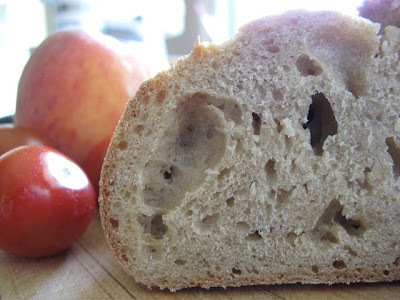 Tear or cut your bread into rough 1 inch pieces. 2. 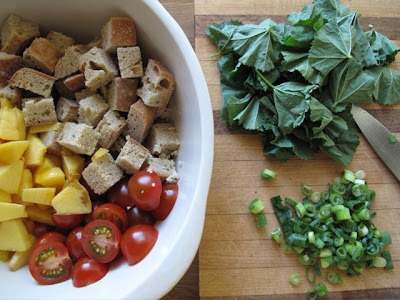 Place bread in a bowl, add tomatoes and remaining ingredients of choice. Add garlic and herbs. 3. Drizzle generously with olive oil and vinegar. Season generously and eat. Oh, and in case you thought that even this dinner was immune to the daily frustrations of life these days this was half of dinner, before we even started. 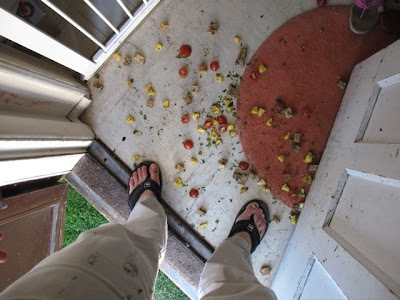 I was coming inside after taking a few pictures and the dog jumped up, knocking the bowl from my hand. Sigh. A few months ago The Monster and I made a special trip to Chinatown. In addition to paying the taxman we wandered around in search of something very special - kid friendly chopsticks. I couldn't tell you the name of the store we found them in, with me not speaking Cantonese or Mandarin. But we found the pint sized chopsticks and the little black plastic chopsticks training. I don't know if that's what you call it, but I refer to is as the training wheels for the chopsticks. 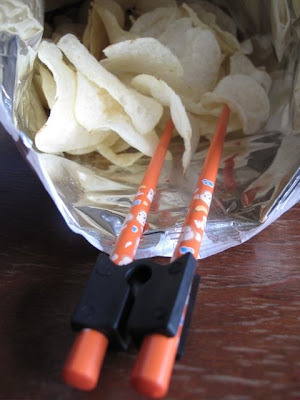 And here is the household's favourite use for chopsticks: eating potato chips. 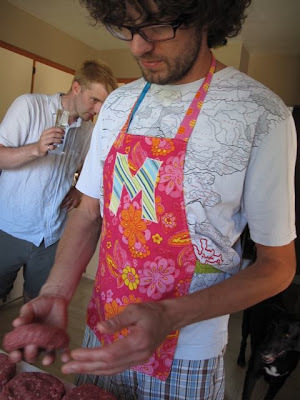 Hubby has been doing this for as long as I've known him. Before you scoff and giggle at this odd habit, think about it for a minute. Most of us eat chips while watching TV. If you use chopsticks you do not have the lick your fingers or get the remote greasy. Ingenious, right? So Hubby has The Monster trained up. Now, if only I could get him to stop feeding her chips. The next time you've got friends coming over for dinner or brunch and are worried about impressing them, make this dish. You will look like a star, with 10 minutes of effort. Just 10 minutes. It works for mother-in-laws too. 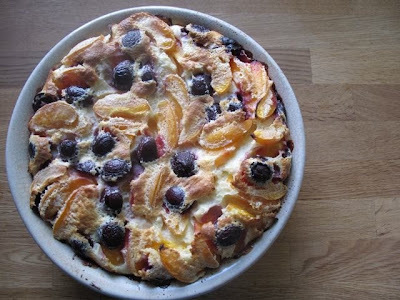 This is the humble clafoutis. See, it even has a fancy French name (pronounced kla-foo-TEE). It's not a showstopper cake topped with ganache. Nor is it a buttercream topped cupcake. And nay, it is not a labor-intensive pie. Just a simple clafoutis. It does look good, though, right? 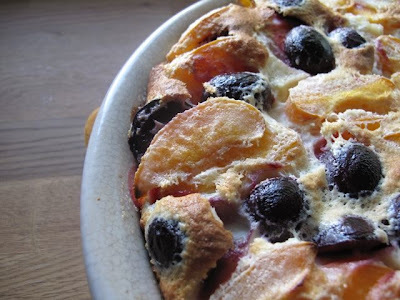 Traditionally a clafoutis is made with cherries, and nothing but cherries. But we came home from a weekend visiting family facing a limited supply of groceries. I had a lot of apricots and a lot of cherries. With just a few other simple ingredients we had dinner. Yes, I said dinner. We had a late lunch on the way into town so this is what we ate before the girls went to bed. I whipped it up, stuck it in the oven while we finally hung the swing Smilosaurus got for her birthday. After the tantrums started I took the ridiculously good smelling 'pancake' out of the oven and we promptly ate it all but one piece. And that one was eaten Nigella style at 3 am by me. It really is an easy recipe. All you need is a blender and a pie plate. Smilosaurus even pushed the button on the bender for me. Without any effort you can have dessert, or my favourite concept, brunch. And the taste? It is described as a pancake or custard. I thought it was more crepe like, but a bit heavier. Baked custard? Just know that it isn't pie, cobbler, crisp, crumble or buckle. It is clafoutis. 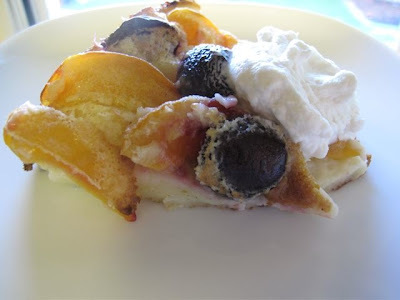 As I said, I used apricots and cherries, but any stone fruit or berry would work. Perhaps peaches and raspberries or plums, apricots, and nectarines. 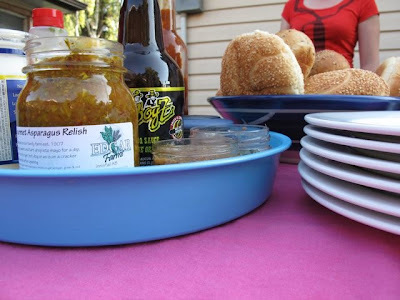 The recipe is based on one I found during Summer Fest, and comes from good ol' Martha. 1. Peel and slice fruit (peaches, plum, or apricots into 6-8 slices and cherries in half). Set aside. 1. Butter a 9 inch pie dish and dust with a tablespoon of sugar. Preheat the oven to 350 degrees F.
2. Blend all ingredients except for the fruit in a blender for a minute. 3. Pour half the custard mixture into the prepared pie plate. Arrange fruit on top and pour the rest of the custard over the fruit. 4. Bake for 45-55 minutes, until the top is golden brown and puffy. Serve warm or cold with whipped cream. Hubby and I missed the whole loft train. For awhile we referred to our flooded and unfinished basement as a "New York Open Concept Loft-Style Basement". Had we eschewed getting a dog I think we may have found ourselves one of the original warehouse conversions in downtown Edmonton. Okay, I would have fought for it and he would have defended his manly right to a lawn. Back then downtown Edmonton was a place that positively died after 5 pm. Other than a handful of restaurants, a mediocre casino, and lots of offices filled with hard-working lawyers there wasn't much going on. And what little was happening was the sort of activity that most of us don't want to see. No matter how cool the space I never would have convinced him to move there. I still don't think I could convince him - even without kids and dogs and the new lawn - but the City Market could possibly be tipping point. Downtown Edmonton now is certainly not the place I wanted to move to 10 years ago, and not even close to the place it was 6 years ago when we left the city. Damn, it is a vibrant place! There are phenomenal restaurants that actually serve more than lunch, lofts and condos sprouting up everywhere, and retail stores that sell gorgeous, trendy, and expensive stuff. There's even a grocery store. Not a corner store, but an actual grocery store right in the core. 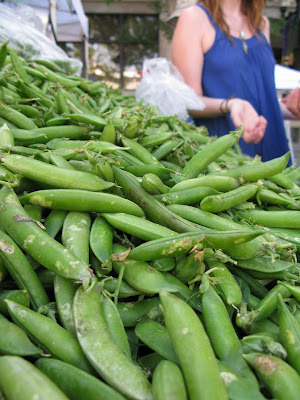 The City Market, however, is an homage to the old nature of a farmers' market - bringing produce to the urban markets. 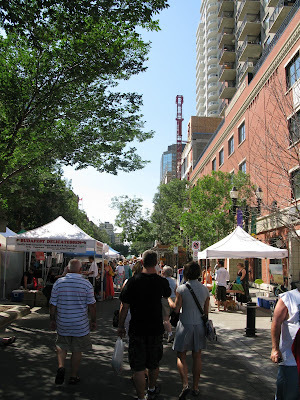 Located just off Jasper Ave, on a street filled with refreshed and new buildings, the City Market brings over 60 vendors - both food and craft - to the new denizens of downtown Edmonton. it also brings people tired of the crowds, strollers, and popularity of both the Strathcona and St. Albert farmers markets. Plus, they have really cool traditions. My sister-in-law and I - kids in tow - hit the market on what was probably the first really good weekend for local produce. 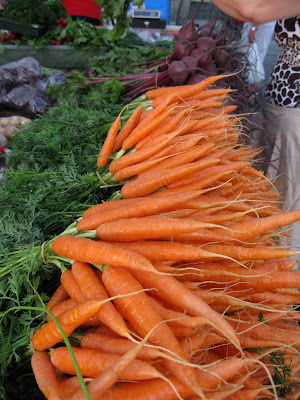 There were carrots, peas, greens, potatoes, herbs, strawberries, scapes, baby beets, and those fabulous sour cherries. We sampled and drooled our way through the stalls. She's been there before so she pointed out some great crafts (I got a fantastic dress for The Monster) and knew where to get the better deals. We weren't crowded with our strollers and my nephew flirted his way into the hearts of everyone woman he met. It was really fantastic to see the area so alive, so vibrant. As a former Edmontonian I will fully admit to pride in the city, the area, and especially the market. In fact, the only thing that spoiled my morning was the lady who stole my strawberries. Seriously, I said quite distinctly and not loudly that I wanted two pints of strawberries to the vendor and this lady pushed her hand through the person next to me and my sister-in-law and practically snatched it out of the vendor's hand. Considering that there were only three pints left and one of them as already in the hands on my sister-in-law I, being a nice person, said nothing and settled for one pint. There must also be something special about the atmosphere there. 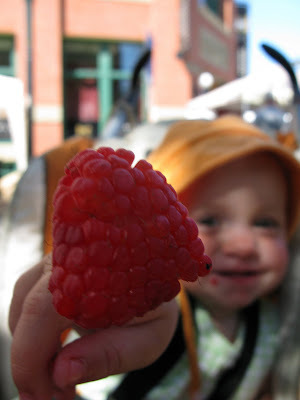 Immediately after I delivered a huge speech about how Smilosaurus ate everything but raspberries she started grunting, pointing, and rubbing her hands together while I paid for my peaches and raspberries. For those of you not up to speed on baby speak that means "Please, please, pretty please can I have that? NOW!" So I grabbed another pint, we sat on the curb, and promptly ate them all. Yup, there is definitely something special about the place. Behold, the sour cherry. And the sour cherry pie. Oh, the sweet sour cherry pie. Until about 10 days ago I always thought that sour cherries were an edible myth created by American food editors. 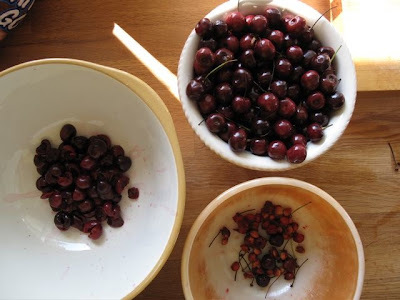 Created to make do with smaller Bing cherries or like fried green tomatoes, something to do with unripe fruit. Then I was wandering through the tables of yet another BC fruit seller at the market, comparing prices for a small container of blueberries, when I noticed the sign. If it wasn't for the sign I probably wouldn't have noticed the sour cherries. They looked like a smaller, paler cousin to the giant Bings. So I snapped up a large container for a ridiculous price and daydreamed about all the recipes I've read over the years. And then I remembered that I gave away all my magazines. But really, there was only one thing to do. How could I not make pie to pop my sour cherry? Yes, I just said that. That's how monumental this is. The first taste was surprising. You know the canned cherry pie filling you can buy? The kind that fills every commercial pie and black forest cake? Surprisingly, a plain sour cherry tastes exactly like that, just less sweet. I had kind of figured that this mythical creature was like grape juice - the real tasting radically different from the processed. That taste excited me immensely and gave me a huge boost of confidence. I figured there was no way to mess this up. 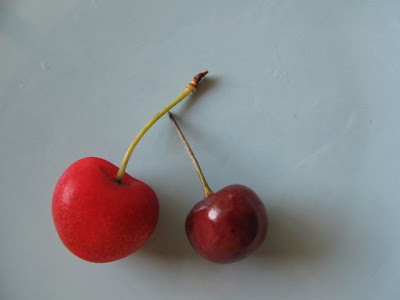 To give you an idea of the size of a sour cherry here it is next to an organic Rainier. The organic ones are smaller than the regular ones and that sour cherry seemed positively tiny in comparison to a regular Bing. They were easy to pit, simply coming apart between my thumbs. The Monster and I pitted the cherries, we boiled the juices with some cornstarch and sugar, stirred in the rest of the cherries and a generous pat of butter. Then I made some pate brisee, chilled it, and when I rolled it out I knew I had a winner. I made the pies, mopped on some cream, and sprinkled them with raw sugar for some extra crunch. I put them in a hot oven, then I promptly forgot about them. It was a near disaster in an already frustrating day. But I caught them just before complete failure. The juices ran just a little and those were the really cooked bits, and easily picked off. In the end, though, they were the perfect finish to an eventful day. And like any good first date, it ended well. So well. I do have some cherry pie filling left. I froze the bit that was left in the hopes that I'll find more sour cherries this weekend. If not, then I figure I'm going to try and use regular Bings, perhaps with a bit of almond extract added. 1. Make your pate brisee or pie crust recipe. Chill well. 2. 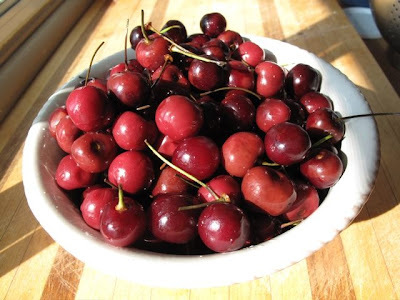 Once you have pitted your cherries drain them. 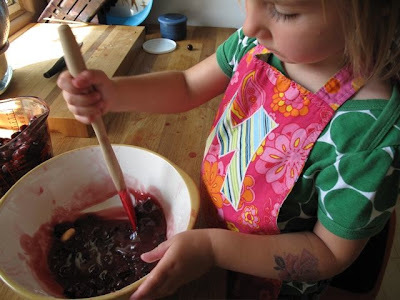 Pour off the juice into a small saucepan, with one cup of cherries and the sugar. Heat over medium high heat until the sugar is dissolved and liquid is boiling. 3. Meanwhile, stir the cornstarch and the water together. Once the cherry liquid is boiling add the cornstarch mixture. Continue to boil until the liquid is clear, a few minutes. 4. Remove from heat and add the butter. Once the butter is melted add the remaining cherries. Set aside to cool. 5. Once the mixture is cool take your pate brisee out of the fridge. On a lightly floured surface roll out the dough to a quarter inch thickness. Cut into roughly 4 by 6 inch squares or cut out circles about 5 inches in diameter, whatever is your preference. 6. Working one at a time, place 2 heaping tablespoons of filling on the center of each piece of dough. Fold one side over the other and seal well by pinching the edges together. You could finish by pressing a fork around the edge. 7. Place on a Silpat or parchment lined cookie sheet, brush with cream or milk, sprinkle with raw sugar, and cut two small slits in the top of each. Place in the freezer. 8. Preheat your oven to 400 degrees F.
9. Bake pies for 15-20 minutes, until golden brown. This is the second week for Summer Fest '09. Make sure you take a browse around the other participants. A Way to Garden, Matt Bites, White on Rice Couple, and Steamy Kitchen, among others are leading the way. Make sure to share your own Summer Fest experiences here, there, and everywhere. Do you remember when you were 16 and you finally got that guy you loved FOREVER to notice you and suddenly you were agreeing to go to the movies, without either of your parents driving you? The excitement, the knots in your stomach, the agony over what exactly to wear? And then a zit that appeared on your face the night before. Or what about the first time your mother-in-law came over for dinner? The fretting over the right menu, timing your dishes so that nothing was cold, and obsessing over whether the house was just clean enough? And then the dog upturns a plant and you have dirt everywhere. 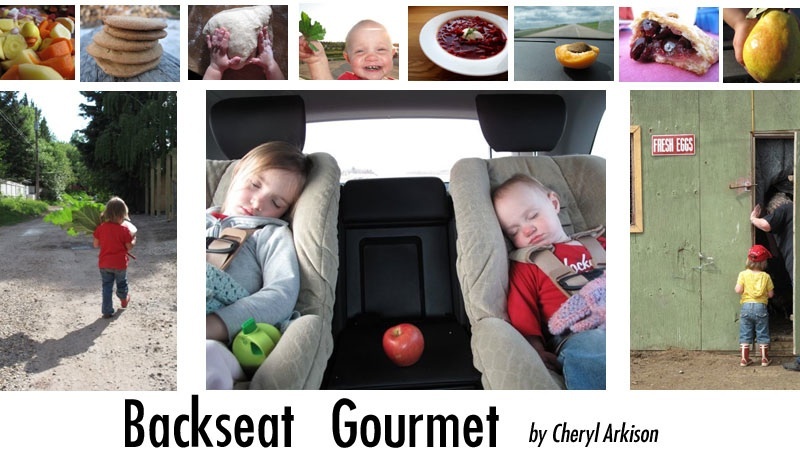 Now, imagine that you've invited over two major foodies and fantastic writers. Oh yeah, and they're bloggers too and you know that they're going to write about and photograph what you made for dinner. Nope, no pressure there.Friday night we hosted Julie and her gang from Dinner with from Dinner with Julie and Aimée and her family from Under the High Chair. Seriously, no pressure whatsoever. It seemed like a pretty stress free menu. Or so I thought. Since Julie did such a good job of summarizing our evening together - although she forgot the part where Danny, Aimée's husband took out Willem, Julie and Mike's son - I thought I would highlight the prep. The nerve-wracking everything going wrong prep for when two major foodie bloggers stop by for Friday night dinner. Let's start with dessert, because that's what I worked on first. I lucked into some sour cherries at the market last week, so pie was definitely called for. The Monster and I tucked into pitting the cherries while Smilosaurus had her last official morning nap. Sour cherries are ridiculously easy to pit, no tool required. We just put our thumbs on either side of the pit and pulled the cherry apart. Well, that's what I did. The Monster apparently would start by biting off half the cherry, then picking out the pit. And, ever helpful, she would put both halves of the cherry in the bowl. So, in case I forgot to mention it on Friday night, the cherry pie had a little something extra in it. Then there was the ice cream. Sour Cream Ice Cream. I was brave and the three of us girls went off to get our groceries. Sour cream? Check. Half and half? Check. Heavy cream? Check. Frozen ice cream canister? Check. Blender? Check? Coordination and space in the fridge? Uh, no. I dropped the blender on the floor as I was trying to fit it in between a case of beers and some herbs. It went everywhere! In fact, looking at that picture I realize that I still need to clean the sideboard. 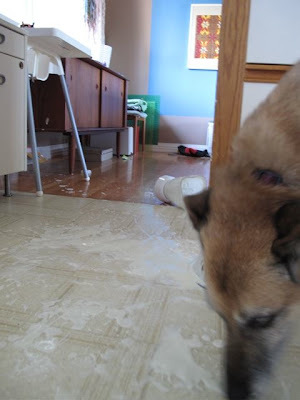 The dogs had a field day cleaning the floor and The Monster cried for a half hour straight. Nothing but tears, nay, wailing, over spilled ice cream. Thankfully Hubby came home in the middle of her crying so I could run out and buy more sour cream while she cried herself to sleep. I also ran out to the market while the girls slept to pick up the corn, avocado, lettuce, beef, and the rest of our groceries for the week. While unpacking I realized that of everything I picked up I forgot to buy peaches. So, no grilled peaches for dessert. Sigh. Instead I set to making the pies and getting everything else ready. I had my pate brisee cold in the fridge. It rolled out wonderfully and I made my pies. Then I went outside to get the yard a little bit in order. And promptly forgot about the first tray of pies. I saved them from complete destruction. 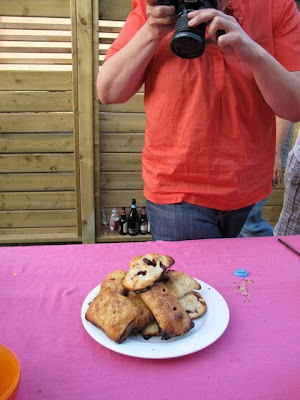 And Julie even said she loved the idea of the juices oozing out of their pastry hold. I still scolded her for taking a picture of it. We just picked the really crispy bits off the edges. Finally, and this was by no means a disaster, I ran out of ketchup. No ketchup is not cause for alarm, but I am firmly in the camp that burgers need ketchup. I was also anticipating toddler meltdown if their was no ketchup for the hot dogs. Just as I prepared to call my neighbour who is stocked for the war (I call her my emergency pantry) I remembered a bottle of homemade ketchup in the cold storage. And the reviews were so positive - except from my kid - that I might consider the effort again. All was not horrible. Indeed, some things went ridiculously well. I made the chili salt for the watermelon and jicama sticks with my secret stash of dried chili from Baja. 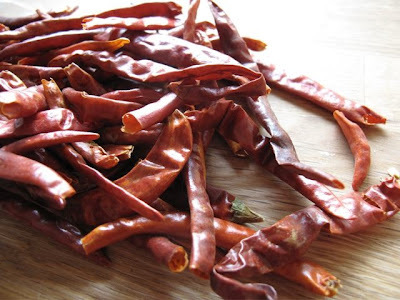 I simple threw a handful of chili in a non-reactive frying pan with a clove of garlic. Let it heat up until I could really smell the chili heat. Then I blitzed the whole thing in a food processor with a little less than a cup of kosher salt. I think we all preferred it with the watermelon, and I'm pretty sure it would be good on mango too. Hubby and I thought that maybe the leftover salt would be good on some grilled chicken, but not too much. Then there were the burgers. Oh, the burgers. These are the spec-i-al-ity of my Hubby, Morgan. 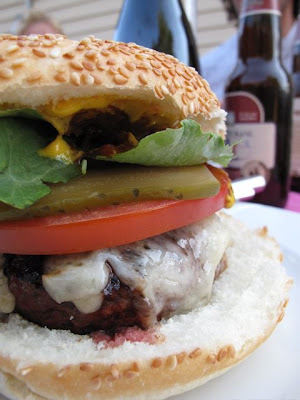 I once made the mistake of raving over a burger in a seaside shack in Digby, Nova Scotia as the best burger I ever had. I swear that if I hadn't recanted the statement right then and there we never would have married. There's nothing special to the burgers. Just good quality ground beef, lean ground beef. Don't try to be healthy and by extra lean, your burgers will be dry. Lately we've been making them from Hoven Farms beef. Very flavourful. So take your beef and form it into a patty, preferably a large patty. Do not season the beef, don't add eggs or bread crumbs. This is pure beef. Now you know why I only served a green salad on the side. After a liberal dosing in CattleBoyz BBQ Sauce he cooks them slowly on the grill. They stay juicy, they get a great crust, and they are perfection. Meaty, so juicy they drip off your wrists perfection. So the floor was still sticky, the lawn never got mowed, and I highly doubt I made The Monster's bed after her nap. Oh, and I did indeed have a brand new zit to greet our guests. None of that really matters if everyone is well fed and the company good. The night was really as good as it gets when you've got 6 tired adults (long drives, gout, sleepless nights, and working too much) and 5 kids under the age of 4 to keep track of. Note to self: build gates for the fence. We photographed our food more than our kids, we chatted and gossiped about other sites we visit, compared horrible neighbours, and we lubricated everything with Prosecco, Moscato, and beer. It would have been lovely to sit leisurely around the firepit and actually have some girl talk among us bloggers, but sadly the Hubby's wanted our help with the kids. 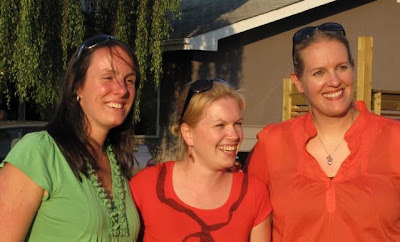 I think Julie and I might have to plan a weekend in Montreal, sans kids, to get that! Make sure you check our Julie's review of the evening (including the recipe for the sour cream ice cream, and keep an eye on Under the High Chair for all of Aimée's vacation reports. 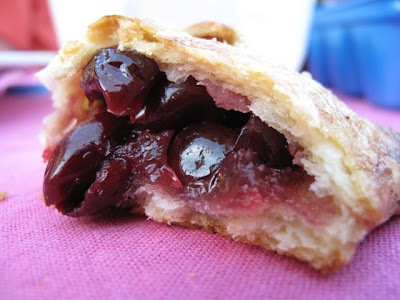 And stay tuned here this week, I will actually share with you the recipe for Cherry Hand Pies.